pink and white jig with a shrimp tail. I have my window open in the office. It is freezing! I just can't help but enjoy the sounds in the air, though! Things are changing. I can hear songbirds! They sound so beautiful, and it has been so long! It is interesting. The skies have been blue, the grass is getting greener, yet the trees remain a bare winter brown. It is like summer at one level, yet the trees bordering the yard remain dormant. An odd, odd, year. The winner of the contest has been picked! Congratulations! Please, stay tuned for the next contest! I am going to go out and do some low water fishing. I need to fish after these long days of sitting in front of the computer trying to fix it. Argh! I finally have it going well enough to last until I get a new one. Phoosh! There goes any tax returns! It's true. You spend just as much as you earn. No matter what! You get a bonus, your car breaks down... Same old story! Anyway, I'm off to post the contest, and to fish.. gotta fish, gotta fish gotta fish... 4 lb test, here I come! Everything is wet, and sloppy, and drippy and gray! Get your rods and your tackle and go out and play! The rivers are rising, the forecast says "more"! The wind blowing sideways, I just want it to pour! Soon my rod will be bent and my reel, it will scream! Low waters, and sunshine and fishless days.... GOODBYE! Holy competition, batman! It is an all girls fishing team! There are not many of us around. A handful at best, or worst, however you may perceive us. Those... people. The ones with a feminine side who, regardless, love to hunt fish. We are often looked at as some kind of anomaly. A fishing girl? Why, on earth would a woman invade what is normally a male dominated sport? Because we were born with the desire. Because we live to fish. Because it shouldn't be a male dominated sport, and frankly, we do a darn good job of catching those fish, so look out! You can find Kim Katsion on cold, winter days, towing her drift boat across the coastal mountains from her home in Beaverton, to row members of the ifish board down the Wilson. She tows it, she launches it, she navigates the waters, and she has been known to get her guests into some darn good fishing! Today, Kim, acting as anchor person and bait girl, put together an all women's team to fish in the Fishermen's Marine Sturgeon Derby. Kim selected Julie Cates, licensed fishing guide and team captain to run the boat. Kim and Julie have been pre fishing for weeks. Fishing on the team are Carolyn Simmons- (Chuck Thomas' girlfriend). Chuck is a guide on the Kenai, Kasilof and Clackamas; Julie Lum- Pete Fields' wife (Pete guides on the Deschutes) and another fishing enthusiast, Kathy Schreiber. Hopefully, unless the girls are into a hot bite, I will be receiving updates by phone throughout the day about their adventures, and I will post them here! Since I was invited to fish on the team, but was unable to, I am especially interested in the progress and fun these girls have! Ah! I wish I could be there! c o m p e t i t i o n.
Holy sturgeon derby batman! It's an all women's team! Annnnnnnnd here are the gals at the derby! Haven't heard who won, but I'll get that info ASAP! Whooooo hooooo! Need I say it? The sun is shining and it is a beautiful day! Today, I am going to be nice to me. I am going to go lay in a tanning bed and pretend it is summer. Then I will try to get into physical therapy for a massage.... ahhhhh. This rinky-dinky monitor is a challenge for me. I use many tools to help me work comfortably. One of them is a large monitor that helps me to see. One week of hunching over this and squinting my eyes has my shoulders and back in a wrench and I am sick of pain pills. That's no way to live. I just got a quote from Dell for a whole new system, and by golly, I like the idea! I have to fill two tube feeders every morning to accommodate the voracious appetite of literally hundreds of gregarious Pine Siskins that have found us. Their flight feathers flash yellow at me all morning! Sometimes I can't see the feeder for the birds! I still have only one hummingbird who flts by once or twice a day, and I am waiting for a rerun of last years migration. The yard, however, is full of rufous-sided towhees, varied thrush, with its dusky breast band, chickadees-two kinds; black-capped and chestnut-backed, song sparrows and stellar jays. Stellar jays are so shockingly beautiful. If they were rare, we would be in awe of them, but they are so rampant and bossy! They are a beautiful nuisance. Like weeds, they are a flower, simply out of place, but in this case out of control! I love this time of year! The green grass is starting to poke through thickets of dead brambles along the roadway. The trees shadow across the meadow is shorter than yesterday. It is the start of that short period of time between when the road way seems to get lost in the growth of new spring grasses, and when the road crew comes to cut it back for summer. The bird songs break the long silence of all those still winter mornings. Everything is thick, lush, new and alive! A fresh new start for my eyes. With the strain of trying to see lately, it is a welcome change! Oh, one more thing, e mail Dream Casters for the latest info and to get on their list! Hey! It's sunny out! Wow! What a change! I feel all sunkissed due to the tanning thing going on yesterday, and now I am in a sleeveless shirt! Let's do summer! Had a hummy today again. Last year it was March 18th that I had the whole migration thang going on, and I am marking that day for this year. I will go outside and yell....."Here hummy hummy hummy, it'ssssssss time!" I am sooooo excited about the conference at St. George, Utah for OWAA. I am going June 2nd through the 6th! I will learn all kinds of new techno media stuff, eat, relax, and enjoy the scenery! I am also going to Clam Gulch Lodge in Alaska at some point! Wheeee hooooo what a summer! As for now, I am going to go with Bill down in tidewater to hunt for the illusive steelies that hide from me. A game of hide and go seek, I mean hook! Yes, that is what I want! My TH custom rod will accompany me..... I love it! Bill says, "What you need is two days in bed." Kim says, "Jennie, post on the board that you are taking the whole week off!" Michael says, "Woman, take care of yourself!" RT says, "Flat on your back!" I asked the kids, "Do you ever remember me sick in bed for even one day?" I made it out fishing yesterday for two hours before the complaining started again. "I can't move my neck..." Bill drove the boat back to shore. Of course, I didn't mind. Before we even put the boat in, I had a steelie to shore, right there at the ramp! Chronic pain, they call it. The doctor doesn't know what to do except raise the dosage in my pain pills. Yuck. I hate being on pain pills, but what else can I do? This time I think it is due to straining over this small, borrowed monitor of Bills. Yet, here I am. Do I need to be here? After I write this, I am going to shut off my computer for a while. I am caught up on billing. Web page work can wait. I am going out to buy some pretty stationary. I remember back in my youth, I would receive stationary for birthdays and Christmas. I loved it! Clean sheets of paper, new notebooks, have always intrigued me, invited me to color them with words and neat handwriting. I will even buy a new pen. I am going to personally write letters to people that mean something to me. E mail is great, but it lacks so much! I have so much to be thankful for! So many people that I need to thank for their friendship, their kindness. I feel like I have become so wrapped up in this computer, sometimes, that I am letting too many important things go. Gratitude. I need to feel it. I need to go outside and sit on the porch in the sunlight, coffee in hand, and listen to the sounds of the river, the birds in the air. Last night I rose from the computer, and sat down to watch the news. Murder, mayhem, shootings, earthquakes. I heard the kids outside, joyfully playing on the trampoline. Their innocent love of the outdoors and life pulled at me. I glanced outside to see them, exhausted, laying on their backs giggling, staring into the sky. I rose, went to the refrigerator, poured orange juice and ice into appropriate glasses. I followed their trail of laughter outside into the dim evening sunshine. "Cocktail hour!" I declared and served the drinks. I sat right down in the damp, spring grass, drew in a healing breath, and fed their eager need for attention. "Watch this, Mom!" My tension began to ease. Time is oh-so-precious. What have I been missing? I realized that the kids and Bill's most familiar view of me lately is my back, hunched over this monitor. Pain pills aren't the answer, Doc. My self prescription is less time at work, more time at life. To feel gratitude for things I have. Less time spent wanting something different. Time with my family. Time spent digging my toes into the sand at the beach, feeling spring grasses with my fingers as I sit in the lawn. More time staring at the bottom of the river through the clear water as our boat makes it's way toward the bay. Less time worrying about bills, and more time spending my money on ice cream. I'm going to go buy stationary now, and write to people who need to know that I appreciate them and everything they do. I'm going to sit at the kitchen table and talk to Bill, as we count different species of birds. I'm going to meet my kids at the bus stop and listen to their stories. I don't need double strength pain killers. No thanks. I don't need to strain to see with my eyes what will cure me. Larry Hammel and myself won with a 51", 49", and 48" fish totaling 72.8 lbs. be fish bait. We had fished this area a few times before with great success and were confident that we could catch our limit! out. Right at the slack I hooked into a fine 51" keeper. After tying the fish off to the side, in my excitement to get my line back into the slot, paying no attention to the trolling motor still running in reverse to keep us in place! My line started peeling off the reel and into the prop. With 100+ feet of tuff line in the water and at least that much on the prop my HIGH moment came to a abrupt stop. not do the job. I hooked into an oversized fish that would not come up for anything and about that time Terry set the hook into a nice fish that came over and rapped up with my line. I had to jump up onto the motor box so they could pass the rod back and forth to get it free. It was our next keeper, a fat 49" fish. What a show! The guys anchored up next to us got a good laugh. Later, after releasing several fish in the low 40's Larry came through with another fat fish measuring in at 48". weigh-in. We all felt that our catch was respectable but really did not think we would actually place. We all did our best as a team and we felt good about it. One last bit of excitement - Just below the I-5 bridge with the check in area insight, our boat shutdown - we had run out of gas in the first tank. It took some cranking to get the fuel pressure back up and we were on our way again. Thank God Terry's boat has two tanks. This years tournament was not without the threat of one team thinking they could fool everyone. 3 fish all about 59". The hitch was all three fish were dead at weigh-in and it was going around that one of the team members was a gill netter! It was quite a surprise during the awards ceremony when Eric Lindy announced second place had missed out by less then a pound. We were overwhelmed with excitement! We had taken the tournament! this years tournament by disqualifying that team. In closing I must give 100% credit to our Capt. Terry and partner Larry. to have had the opportunity to fish on their team in this derby, to learn from them and to have them as friends. It is because of them, I have become a better sturgeon fisherman! day will be one worth watching! New! You can now search ifish! It's cool, try it here! The main search link will be listed in the left hand column permanently. What a nice day on the Wilson! 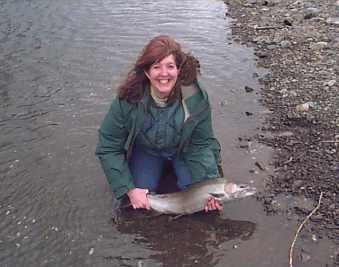 The Northwest Steelheaders "Wilson River Wild Broodstock Fish-a-long" was today. Bill, Bigstew and I decided to join in. We woke this morning to perfect fishing weather. Overcast, cool, but not raining. The east wind was not screaming down the canyon either. Today, it was calm! We fished mainly with jigs, pulled plugs a bit too, but the fish hooked were on jigs. We didn't get to contribute to the broodstock pen, but we had a heck of a lot of fun! We caught one for four fish hooked. Bigstew lost one, I lost two, and Bill landed the one he hooked, a down streamer. I lost both of mine on 8 lb fluorocarbon leader. GRRRRR. I don't know about that stuff. Think I'm back to Maxima for a while. My deduction is that the heavier line for fluoro is good stuff, but the light stuff can be scary. It's a great, nearly invisible, low water presentation, but if I can't bring them in??? I've lost three now on fluoro... During a poor steelhead year such as this one, that is too many! O.K., off to another fun part of the day, the dinner for the Fish-a-long people! I got oysters from Tillamook Bait for the gala event! Wonder how many wild fish everyone got? Bill and I and Bigstew didn't help at all, but dang..... We had fun trying! Oh.... hey, guys! Please see what is up for the month of April..... PBS does it! One last funny comment. Spell check wanted me to change Broodstock to breadstick! HA! How totally embarrassing. I accidentally sent an e mail to people I didn't mean to send it to! I think I hit a button to send to the entire ifish list. It was a list of jokes of questionable adult humor that I hadn't even totally read. Now I have read the whole thing and I am blushing. Geeeez. Be careful with your e mail, read what you send! I just mindlessly plucked out a few names who I thought would appreciate it, and somehow it went to everybody! I'm so sorry! Forgive me? Just who received it? I don't know! Oh well, I am practicing humility this morning. The internet brings forth an entirely new and different medium for people searching for people who share similar disorders. Self help groups, e mail groups, various dot coms who offer list after list of symptoms and answers to: "What do I have, what can I do to fix it, is there anyone else out there who has it?" I listed my symptoms on the search engine. I found my answers. I notice it's first symptom occur with the first daffodil that pops out. Within the realm of different symptoms for varying degrees of this fever, I found the precise, scientific term for my illness. Better known as Spring Chinook Fever. The incubation from onset Spring Chinook Fever until full blown attack is approximately one month. During this period I can expect to have sleepless nights, nervous periods where I phone people out on the river asking for reports and vivid dreams of hook sets. Daydreams of me, holding a spray can of water, trying to douse out the flames of a springer steak on the BBQ, dripping with oil, catching fire. It's scary. My mouth waters. I jump when the phone rings. I don't say hello.. I say.. "Herring or prawns? Willamette or Columbia?" I can be found madly searching through newspapers, watching the news for any signs of a fix for my affliction. One of the best support groups I have found to help me through this agonizing period is the discussion board on ifish.net. You thought you were alone with this, but you are not. Here you will find many other people with the same darn disease. Most often the board is a peaceful place where you can discuss plans of attack against our malady. Daily/hourly doses of reassurance. You are O.K. You are normal. It's scary knowing you have Spring Chinook Fever when there is nothing you can do about it for weeks. You can live with it. You can do it. You know, through fellow sufferers that we have made it through this period before. The sad thing is, however, that this disease has several cousins and I seem to have no resistance built up to any of them. Every summer I catch a trout tickle, a fall chinook chill, a steelhead sickness, followed closely, with not much time for recovery, to the present.... The dreaded Spring Chinook Fever. I have learned to live with it. I don't think it is listed under current disabilities, but I swear I am going to approach the powers that be that there are several of us out there that find it difficult to work during the worst attacks of this illness. I believe that with all of your help, we need to get the word out about this terrifying, little known, and extremely disabling condition. Thank God that the internet has brought us together. They say God gives you no more than you can handle. I must be oh so danged special. The kitty door that Bill made keeps flapping in the wind and every time it does, I nervously watch for my little Ginger kitty. I remember her "lick-lick-bite!" I remember how small she was, and how sick she was, when we found her. She is/was a people cat. I bonded with her. Last I saw her was yesterday evening. She may just be out, but that is so unlike her. I am very, very sad and nervous. I can't imagine life without her. She brought smiles to everyone. Including Dee Dee the cat hating black lab. My computer is a mess, I don't know how/why I got online, but as long as I did, I thought I would post. Who knows if I will still be online when I finish this! I am typing 100 mph! Good news.... I have a Dell on the way. Bad news.... It may take two weeks. Happy Birthday to Bill. He is also half broken hearted, and is wondering how this could happen on his Birthday. Not much fun. He is walking around in a slump. Gin Gin. She was painted like a chum salmon, and Brent helped me nick name her that. I love her. Loved her? Where is she? Please, be patient as I rebuild my internet world with new technology. I won't be as apt to immediately answer e mails for a bit. I will get it all done though. You'll see! Hey, pray for my cat's safe return? I know it is silly of me to ask. But..... Just do, please? My cat is home! I love that little chum salmon! I am going to hug her/scold her/hug her/scold her! Sure sheds a nicer light on the day. Bill is happy, I'm happy, the chickens are happy, and who cares about the danged computer anyway!??????? The vet thinks she is in heat and out searching for a Tom. Doors locked till she is fixed on Monday! A little Crown Royal toast is in order! Happy Birthday to Bill, Happy Birthday!!!! Off to finish the cinnamon rolls I am baking for Bill's Birthday fishing trip with Bill Monroe, Jim Martin and Dudley Nelson. It was a surprise I put together for him, including rolls and fried chicken and lots of good laughs. Oh yeah, I also got him a Plexiglas windshield for his jet boat so that his glasses don't get so wet when it is raining and we are blasting down the river. Off to hug my darling chum salmon. Sick, sick chum salmon kitty. She has a fever, is listless, and today I will take her to the vets. I will, however, bring along my rod and reel, just in case she just has spring chinook fever. CHAT TONIGHT with Gone Fishin Guide Service! Just put up a contest to win a fishing trip with Jennie and Bill! FUN! I love to meet ifish people! Enter! Oh yeah! Dream Casters tonight! Drop all plans and have a 'feel good' night! My son is the mayor of Wildcat Valley. It was a privilege yesterday to volunteer at his school. Wilson school in Tillamook is doing a wonderful project! For an hour a day, they turn the entire school into a city. They have banks, post offices, stores, newspapers, and real wildcat valley money! They get paid for jobs, have to pay rent for businesses, and even have police around, so that you get fined for running in the halls! Not only that, but he treated me to a soda at "The Catnip Cafe!" It was a fun diversion from my work at home. Ginger the kitty has pneumonia, but seems to be responding to her medicine. Love that little chum salmon. Bill is out fishing with his birthday gang. I got invited to go with Joe Schwab, but my car is breaking down, my computer is a mess, I have to go sign my taxes in Warrenton and meet with a client in Seaside. Other than that, I have nothing to do. Oh yes I do! I have 10 web pages stacked up, waiting to be fixed! ARGH! The bulletin board is running along smoothly after things got a little out of hand for a while. Challenges and decisions. Being a moderator is a toughie. "Sometimes I think the world has gone completely mad. And then I think, "Aw, who cares?" And then I think, "Hey, what's for supper?" I lost my devoted fishing companion, Hershey, (a chocolate lab-ish) last summer. Since then I have been missing the tail wagging enthusiasm that he displayed as he followed me down the river. It is difficult with my new four legged friend. Although she has had no formal training in birding, it is apparent that it is bred into her. She is a natural retriever, with all the enthusiasm and tail wagging glee of any well bred Labrador. As I swing my bobber and jig behind my back, in preparation for a cast, she attempts a puppy like leap onto it. "No! I shout, and she cowers down. My bobber lands in the water and moves downstream. She crouches down and points to it, with a still and steady gaze. Her tail is erect, her body frozen in anticipation for my command to "fetch it up!" She just doesn't get it. We are not hunting, we are fishing! Still, the happy and eager companion follows me out to the garage, and the minute I pick up my rod, she knows. "Let's go fishing!" I say... and she bounds for the garage door! She follows my every step, darting into the bushes on the way to ferret up anything that may move in her path. My thoughts go back to Dee Dee, Bill's hunting lab. When we first moved to the river, Dee Dee hadn't fished much before. The river was high and rolling. It didn't occur to me that retrieving was an almost unstoppable force for labs. As I hurled my big salmon bobber out into the rage of the river, she immediately followed, without command. Down the river in the current she went. Dee Dee knows most water to be in the still and cold form of duck lakes. It was frightening, for her, and for me! My new companion has the intelligence to stay out of the water. Maybe she knows to wait for my command, but so far, she has clung to the bank like a very well trained hunting companion. Yesterday, she followed me, up and down the bank to sit by my side and observe. I'd stop fishing to bend over and give her an appreciative pat. My new companion is not a typical hunting dog breed. She is not exactly what I had in mind, but I am open to new ideas. Ginger is a fluffy six month old kitty, she is not a dog at all. I don't think she knows that, however. She is feeling so much better after her brush with pneumonia. Good enough for a day of fishing, anyhow. Now she is curled up in my lap, dreaming of bobbers, floating down the river. On another note...I have clouds of Pine Siskins darting in and out by my feeder. They light on the feeder at times and I can't even see the feeders anymore! Just globs of little fluttering wings! They are oddly tame. Yesterday I went out and picked one up. I held it on my finger and it just looked at me calmly before it flew away! I hope they know better when a cat comes around. Still only three or four hummingbirds, but they are a refreshing delight to see when they show up. Bill and the gang got one fish yesterday, and four takedowns. Not bad! Go guys! Off I go... I slept in this morning... It felt good. The kids are home from school today, so no fishing for this girl. Time to go clean house..... Ciao! March 19th When I close my eyes at the end of a long day, I slip into a nice hot bathtub, and let my mind wander. The sounds of the kids video games, or laughter as they bounce on the trampoline fades away as I dream..... This is when it comes to me. Most often my thoughts and dreams take me to places I have only read about. Places I have only seen pictures of, and most often these thoughts and dreams are fishing related. A favorite image pops up recurrently. It is a moose's head sticking through my window on a crisp Alaskan morning! I want a moose in my window! I saw a picture of this once, and I've dreamed of it, ever since! After I feed the moose a treat, I glance out my window at a lake full of dolly varden and Arctic char just steps from the warmth of my cabin. The sun peeks over a tall mountain and sheds it's warmth across the calm lake. I pull on my jeans, and as I open my door I peek from side to side to make sure that my pathway is clear of any brown bear. Brown bear are rampant and free here, easy to view, easy to photograph, along with several species of birds and other wildlife. What I don't know in this scene is what woke me, what really excites me. How many or how big will the king salmon that I catch today be? The thrill of the unknown! The place I dream of staying in Alaska is remote, untouched, and I have been invited to experience it! "Mom!!!! What can David and I eat?!?!" I am jolted out of my daydream, and back to reality. What an absolute treat it was to discover that there really is such a place! A place, unexploited... the owners torn between inviting the public and keeping this treasure to themselves.. Take a peek at this opportunity! Just try and stay home. Hey, hey for the new discussion board! Wah! Just as I was knowing the old one so well! It's cool enough to make a change though. You guys think you have a lot to learn, man, you should see the control panel! I feel like a rocket scientist! I had the "Is it time yet?" fishing insomnia last night and was up this morning at quarter till five. Uploaded a couple new sites and now to make sandwiches, take a shower and get out of here! We are fishing with Captain Joe Schwab of Tillamook in his pretty Duckworth boat! SPRINGERS! Wheeeeee! O.K., outa here dudes. See ya! Someone told me yesterday that you can tell, in my column, when I am having a bad day. Let's see if you can! Didn't sleep last night one wink. Well, towards morning, I think I may have. You know, the 15 minute period where you finally fall off and your alarm goes off? Yeah, that deep slumber that finally hits you. Then, in that groggy state, you can't find your alarm and while reaching for it, you spill your entire glass of water all over your bedside books? So, you stumble over to the bathroom sink, try to brush your teeth around the kitty that is busy swiping her paws at the fun stream of water. Kitty fur in your toothbrush is an irritant. "Oh! This is fun!" Thinks the kitty. "What is this?" That is my contact case kitty... "NO!!!!!" A single contact for me is $300 and not covered by insurance. They are some special sort of spherical magic glass, I guess. They can charge me anything they like, if that is the only way I can see. On my hands and knees I search around, legally blind. Deep in the crevices of the carpet I love so dearly. Why do I love thick creviced carpet? I forget. Somewhere in this house... on the cat's tail, in the carpet, down the drain or in my slipper lies 300 worth of contact. I finally get out an old pair, from when I was 18. My eyes, I realize now, have changed quite markedly since then. My face now three inches from Bill's micro screen. I am supposed to be fishing this morning with Mark Anderson, the Wilson River Wizard. He catches fish on jigs like no other, and I would love to be no other place than there. I still may go. Please, if you are driving around Tillamook and you see a red subaru in the road, (barely) watch out! Protect yourself from my bad day and my lack of eyesight! I am not drunk, I am just blind! Nothing wrong with driving blind, right? It's a free world! The source of my bad mood and mixed up emotions are clear on the board. I was very disappointed to find the dirty laundry part of the biz of ifish displayed there, including public insults to me. I have grown a thicker skin, but still, Ifish is a labor of love to me and very much my baby and I worry about my babies. I refuse to get into a public mud slinging party, so I am just going to stay out of it, or try. (I'm deep in prayer). Bill and I have our reasons for making changes. Confidences have been broken that have affected ifish clients and supporters. I had no choice, and it saddens me and worries me. No one likes change, and I am going to take the day and appreciate the things in life that sometimes we let slide by, while we worry about things we can't change. I can't find my contact. I can't change people. I can't seem to catch a fish. I can enjoy my hummingbirds, and try to catch a fish! I can thank God that I have vision at all. Yesterday while driving, I saw a lady in a wheelchair, legs braced in, and obviously unable to move. She was out on the sidewalk with her nurse or friend. The friend was showing her the flowers in the yard. I imagined this lady young and healthy in this house she might have lived in for years, maybe with her own children, long ago. It made me feel so small, for worrying about things so unimportant. I can move, I am young, I can still plant flowers. Yesterday, Bill and I planted the years nasturtiums in the early spring sunshine. The tulips were poking out. The soil was warm on my bare hands. The chickens pecked around me, probably eager to find these seeds and undo my work. Last night I called Pete Morris. He told me to enjoy the Kilchis River Canyon that I enjoy so dearly, and to not even read the board. Thanks, Pete... Think I will. "Hey, they have Grandma grass!" Andrew always points out as we go by a freshly cut green, weedless lawn. Grandma grass, indeed. The thick, lush, soft, neatly trimmed stuff that asks to be sat on. There is no crab grass in Grandma grass. No sir. It doesn't overlap on the sidewalk either. It is neatly edged. The kids used to play outside at Grandmas and Andrew always noticed the feel of that grass. He notices things like that. I think it is because he was legally blind until he was eight. That makes you feel things more, your senses pick up little things like that. We had a big front yard as kids, growing up. Decorated my two huge walnut trees and a towering-flowering tulip tree. A beautiful big Japanese Lace leaf maple sat to one side. A local nursery man would come to take clippings and starts off of it, because it was somehow unusual. The first memory that comes to mind about Grandmas grass was when I was probably 9 or so. It was a hot mid-summer day. The kind of day that seems to be scarce in these busy times. My friends and I were playing on the long slope of grass that landed on the sidewalk. We used to do summer saults down it, and in the winter time, it made a great snowy slide. The newspaper boy came around and was so shy around girls that he dropped all of his change. We helped him pick it up, but I still have guilt that we later found a dime or two and went to the local store to buy candy. Many, many summer days were spent sitting on that slope, playing jacks on the sidewalk, listening to the sprinkler system turn on and off. Waiting for the berry picking bus to pick us up, first thing in the morning, and not daring to sit down due to the frost that beaded up and sparkled on each blade. Times when the hot summer sun baked the sidewalk and fried our bare feet and we raced for the coolness of the shady grass. Later, fall nights after the football game, sitting on that same slope, holding hands with my boyfriend and whispering sweet things to each other. Wondering if my parents were watching and if I dared to kiss him! Grandma grass. I wish I had the time to make Grandma grass. I look over at the expanse of lawn and meadow and shake my head. I know it won't happen here. I lost my Mom to cancer about 5 years ago. We sold the house that had the large yard and the shady trees. Maybe I will just start one patch of Grandma grass. One small, 3x3 or so area, of soft, weedless neatly trimmed grass. I will tend it, and I will watch it like a garden. My Mom did the whole yard that way! It will remind me of all those years and all those memories, starting with me as a child, and then watching Andrew and David play there. I will picnic there. The kids and I will rush to be the first to get our place! I will sit there and let it tickle my legs and run my fingers through it and be glad that I, even though I don't have access to my Mom, still have access to my own Grandma Grass. Hey guys, once again, please send your fishing stories into Chicken Soup for the Fisherman's Soul. There are so many, many wonderful stories on the board that you have written, that I know some of you could be published! We have a great resource of neat stories here! Go for it! In talking to Bill last night, I told him I needed to fish more. "How many days a week do you need?" We are going tomorrow, Saturday and Sunday. That is three. Why does it seem like not enough? It is never enough! This weekend is the Northwest Steelheaders auction and dinner, so I'll be in Portland. Hope that the rain pushes them up river that far by then! I so badly want drippy, fatty Springer on my BBQ! I love that, when you need a spray can full of water to put out the flames. YUM!!!!!!! Gotta have it! Have a great day, I'll be here working.... while you are fishing! Catch one or two! Wheeeeeeee! Today, Bill is leaving to go to Portland to help his Mother and do a little Chinook fishing in the valley. Being spring break, I have the kids home and they have friends over. Last night they came up with the grand plan of spending the night outside, camping. In the rain, in the wind, deep in the forest they headed out with their sleeping bags and flashlights. This is typical of them. After all, two days ago, they noticed it was sunny, so they went swimming in the river. It was 46 degrees in the river. Bill and I thought they were nuts and that they would back out, but upon inspection, they were gleefully screaming and giggling down the whitewater in innertubes. 46 degree water, 56 degree outdoor temp. They did, however, seek the warmth of the house by about 10:30 last night. I must be old. I still think they have a marble or two loose! We have lots of hummingbirds out, but the Varied Thrush seem to have moved on. The season is changing. The Kilchis will soon be closed and a whole new set of fishing will become available. Still, steelhead fishing is my very fav, and I always tend to get melancholy this time of year. Thanks to Mark Anderson, I am going to try and become more involved in summer steelhead fishing. It is an undiscovered territory for me. I am going to go out and make a few casts into the river. Then I have more and more files to transfer to this new computer. Hope you get your Chinook this weekend, and hope I do too! "I got a new computer, new toys, new fun!" Your computer needs to be restarted. Please reboot your system now. Add printer, connect cables, disconnect printer to add scanner, move the kids computer to where Bill's computer is, and Bill's computer to the kids desk. What is this left over cable? Monitor one goes here, monitor two goes there, printer with A/B switch between the kids and mine, new printer required for Bill. Add weather station, what port is it on? I don't know! "WHAT PORT IS THAT, MR. DELL?" Delete weather station and try again. What do you mean absolute? Wouldn't a forward slash be close enough to a backward slash for the command prompt? Come on! Oh boy! A CD burner! Let's burn a copy of ifish! Two hours later, still copying... That's OK, I am patient. Your computer was not shut down properly, to avoid this message, please shut down your computer properly. We are doing a disk scan. Installing Quicken... I know, I know.... your computer needs to be.. Transfer files from computer A to computer B.
I think I could be here for days! My Varied Thrush are all gone! Oh! A squirrel... and a chipmunk! I do have a fishing rod. I do have shrimp. My life needs to be restarted. Please rebait your hook now. Joe Schwab, of Captain J Guide Service has been keeping close tabs on the Spring Chinook Fishery. If you want to learn some of the tricks of the trade, book a trip with Joe! I'm going with him this week! His boat is awesome, and the chairs on the boat have these springy things that are so comfy when you would usually go banging over the wakes! I loved them! I want some for my birthday! Joe has the ticket on the Springers, but fishes year round. Check out his schedule. Tomorrow... Spring forward. Fall back. I drove David to Oceanside to visit a friend and as I helped him get his things into the house, the rain soaked into my sweat shirt and the wind whipped my hair into a new style. Is there such a thing as weather dyslexia? Are the seasons backwards, upside down and all mixed up or what? All winter long we have been spoiled by very unseasonable, but 'pleasant' conditions. Dry, warm... the things people fly to the South for. Now that we have hit spring break, the sun hides and the clouds come on strong. We are thrown into the depths of what I believe to be late fall conditions! As I sit here, sipping on some wonderful hot chocolate, sent to me in a 'feel good' package from Bev and Dot, (thanks alot you guys!) I find it time to choose your friends carefully. Choose ones with boat tops! I wanted so badly to go Spring Chinook fishing, but the weather, and the fact that Bill has no boat top has me sitting here in the warmth of my home. Last Wednesday I went out on the Columbia and had my fill of being tossed around in the wind and rain, chilled to the bone. The propane heater was barely kept lit when the gusts knocked us sideways. Now I am also feverish and feeling like I am catching something wicked. This must be fall. I must have missed something. Like a season or two? Winter was spring and fall was late summer, what will June bring? Snow? Floods? I am getting ready to go the Steelheaders Banquet and Auction tonight, regardless of how I feel. I love this annual occasion and wouldn't miss it for anything! Tomorrow morning I will change my clocks. However, I am convinced that this is fall and not spring. Therefore I refuse to cooperate with the Spring Forward method.